• The report covers Greenbrier, Pocahontas, Monroe and Summers counties. • Real Estate sales in the 4-county area totaled nearly $10.1 Million during the month of March, 2018. • 57 properties sold with an average sale price of $177,144. • The average number of days a property was on the market was 214 days. • 137 new properties totaling $43,619,594 came to the market in March. • Currently, 1,217 properties are for sale in the area with a total asking price of $333,442,718. • There were 172 total sales year to date through March 31, 2018, totaling $30,038,541. 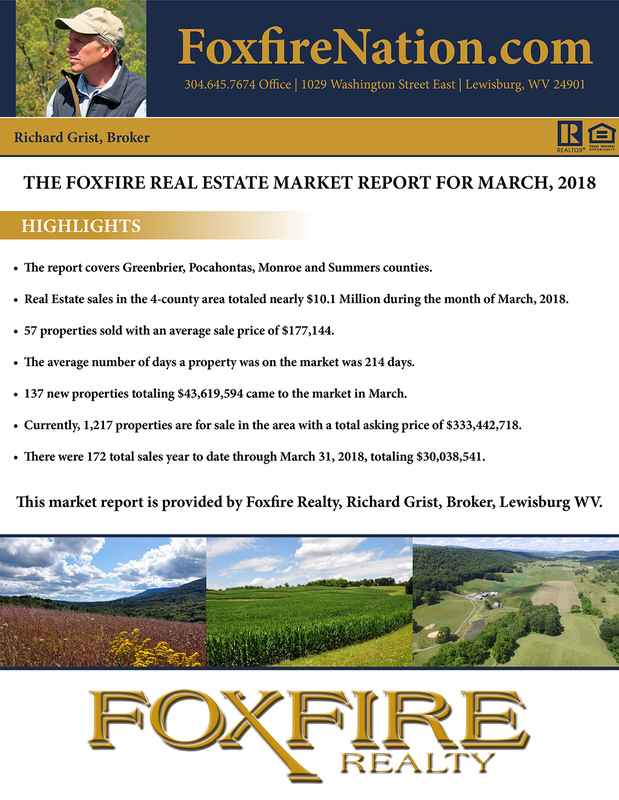 This market report is provided by Foxfire Realty, Richard Grist, Broker, Lewisburg WV.